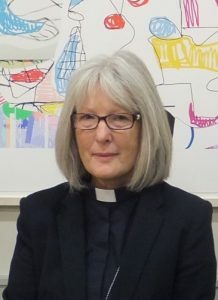 Barbara is the Lead Chaplain to the retail sector at the Canary Wharf Multifaith Chaplaincy and a spiritual director. Prior to joining the team this year, Barbara was rector of seven rural parishes. Barbara has more than 20 years of involvement in Chaplaincy. She set up the Romford Town Centre Chaplaincy which involved creating a team of volunteers and being Lead Chaplain to the retail sector and night time economy. In 2008 she also became the lead volunteer Met Chaplain for Havering Police and staff. Barbara was born in West Ham and grew up around the Romford area. She started her working life in the City of London as an insurance clerk. After having children, she became a youth and community worker for her local borough council. She was ordained a Deacon in 1997 and priested in 1998 in the Diocese of Chelmsford. She achieved a Bachelor of Arts degree in her 50s. Barbara is married with two sons and daughter in laws and two grandsons. She enjoys walking in the countryside, swimming and horse riding. She is particularly interested in psychology and counselling techniques involving spirituality and reads a lot on the topic. She also enjoys theatre and browsing in antique shops. I am very excited to be part of the Multi Faith Chaplaincy team. I enjoy meeting people and believe the chaplains are important resource to those who work in Canary Wharf, whether they have a faith or not.